With our unbeatable prices, we’re sure you’ll be happy bringing your computer to us to repair. Look around our website and if you have any comments or questions, please feel free to contact us. We hope to see you again! Check back later for new updates to our website. Our company is growing fast and so is our technology when repairing all of your computers & phones. There’s much more to come! - Windows & Mac system Password Reset lost or forgotten. 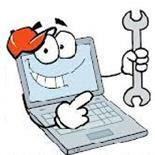 - Hardware/Software Installation, Troubleshooting, Repair, Upgrades, Maintenance. - Computer Network Design, Installation, Security, Troubleshooting, Repair, Upgrades, Maintenance. - Virus, Spyware, Ad-ware, Spam, Trojan, Worm, Mal-ware Removal. - Windows 9x, NT, ME, 2000, XP, Vista, Win 7, Win 8, Win 2003 and 2008 Server, Windows Small Business Server.